Night Ski @ Mt. Norquay on Groundhog Day! 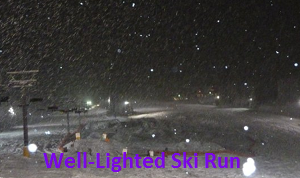 This trip is intended for skiers and boarders who are willing to try night skiing on an easy flood-lit run from 5 PM to as late as 9 PM : it doesn't matter what your ability level is. Please arrive at the carpool location 10 minutes prior to our departure time. If you're an energetic skier after your Saturday Sunshine Village Trip then consider stopping by the Norquay Lodge at 6 PM so as to join us for night skiing!! Please note that skiing/snowboarding activities have inherent risks involved, and that rental packages now include helmets. Event Directions: Turn so as to go west on the Trans-Canada Highway (Hwy. 1)for about 110 km. Take the 2nd Banff exit and go right and a few km up the winding hilly road to the Banff/Norquay Resort parking lot. Carpool Cost: Approximate vehicle expense for this event is $68.88 (calculated at total Km * $0.28, effective Wednesday, April 24, 2019). This is based on $0.15/Km for maintenance, plus current gas price divide by 9. Note that drivers with large vehicles have the option to adjust this cost based on their vehicles. Your carpool driver will confirm exactly how much money they require to cover costs. Please split the actual amount among all people in the vehicle and bring some change as drivers are not expected to carry change. Terrain Classification: This event is exempted from avalanche planning because it takes place at a downhill ski resort. NOTE: No out of bounds skiing is allowed on COC events posted at downhill ski resorts.